A G1 is therefore zero at the theta temperature when deviations from ideality vanish, that is, there are no polymer-polymer or polymersolvent interactions. When T = 0 there can thus be no stabilisation as molecules will interpenetrate without net interaction and will exert no forces on each other. Not only do most linear polysaccharides tend to form spirals in solution, but in their tendency to associate they may form double helices, as does carrageenan, for instance. Under certain conditions of concentration and temperature the double helices may associate, forming gels. Possibilities exist for complex gel formation as with carrageenan, or of xanthan gum with locust bean gum. The locust bean gum molecule can associate over part of its length with the helix of xanthan, for example, while the other part of the molecule associates with another xanthan molecule, thereby acting as a bridging agent. The firmness or strength of gels produced by such interactions will depend on the degree of interaction of the complex with water and the properties of the bridging units. Figure 8.11 On-off switching mechanism for drug release. Reproduced from R. Yoshida et al., Adv. Drug Del. Rev., 11, 85 (1993). Fig. 8.11, which shows the effect of temperature change on the swelling and deswelling of a hydrogel, resulting in an on-off 'switching' mechanism. The relationship between swelling and release in an electrically responsive hydrogel is shown in Fig. 8.12. The mechanism of the current-induced change in volume of the gel is shown as an insert to the figure. Figure 8.12 (a) Responsive swelling (•) and release (■) from PSSA-loaded HA hydrogels when an electric field of 10 V cm01 was switched off. 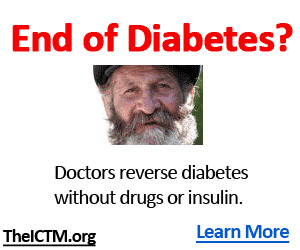 (Reproduced from R. Tomer et al., J. Control. Release, 33, 405 (1995).) 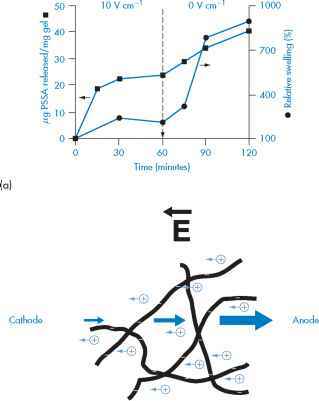 (b) The effect of an electric field on a polyelectrolyte network. The redistribution of ions causes shrinkage of the gel at the cathode and expansion at the anode. 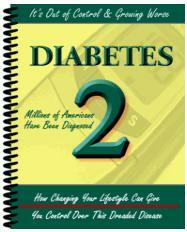 than in the stomach or duodenum; that is, they should swell in neutral rather than acidic or alkaline conditions. In artificial intestinal juice, psyllium seed gum increased in volume 5-14 times, locust bean gum 5-10 times and methylcellulose 16-30 times in 24 hours. In vivo evaluation of methylcellulose and carboxy-methylcellulose suggests that they have two advantages over the natural gums. Methyl-cellulose is more efficient as a bulk laxative because of its greater water-retentive capacity, whereas carboxymethylcellulose gives uniform distribution through the intestinal contents. 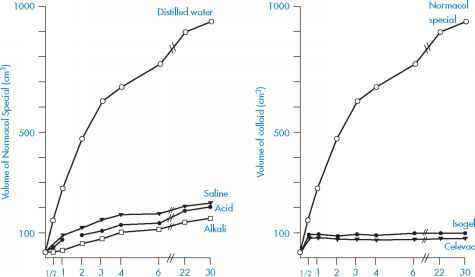 Figure 8.13 (a) The volume attained by 5 g of Normacol Special in various solutions over 30 h. (b) The volumes attained by 5 g of Normacol Special, Isogel and Celevac in distilled water. Reproduced from J. D. Ireson and G. B. Leslie, Pharm. J.,205, 540 (1970). ranged from 5% to 3.1% when 20 and 40 units respectively were added to 500 cm3 of isotonic sodium chloride solution, while plastic i.v. tubing adsorbed 30% of 20 units and 26% of 40 units added to the same infusion bottles (Fig. 8.14). Adsorption occurs rapidly, within 15 seconds. Addition of albumin to prevent adsorption is now common practice. The albumin adsorbs at the glass or plastic surface and presents a more polar surface to the solution, thus reducing, but not always preventing, adsorption of the insulin (Fig. 8.15). The binding is considered to be a nonspecific phenomenon which may occur on other inert materials such as polyethylene and glass. The adsorption of macromolecules at interfaces may be the reason why molecules such as those of hyaluronic acid can act as biological lubricants in joint fluids. In healthy joints only 0.5 cm3 of synovial fluid is required to provide almost perfect lubrication; in diseased joints there are sometimes faults in this system and some research has been aimed at producing synthetic substitutes for synovial fluid. 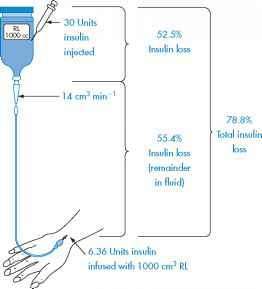 Figure 8.14 Amounts of insulin lost by adsorption to glass bottles and plastic intravenous tubing, following injection of 30 units of insulin. The patient receives only 6.36 units. Reproduced from C. Petty and N. L. Cunningham, Anaesthesiology, 40, 400 (1974).